The Centre for Cervical Cancer Prevention in Sweden has noted in its annual report a substantial increase in the incidence of invasive cervical cancer, especially during the two years 2014 and 2015. I have sub-grouped the data according to age, using the same statistical database of the National Board of Health and Welfare as used by the authors of the above-mentioned report. The increase in the incidence of cervical cancer was shown to be most prominent among women 20–49 years of age while no apparent increase was observed among women above 50. The FDA has noted in the clinical trials referred to it for marketing approval that women exposed to the human papilloma virus (HPV) prior to vaccination had an increase in premalignant cell changes compared with placebo controls. I discuss the possibility that HPV vaccination could play a role in the increase in the incidence of cervical cancer by causing instead of preventing cervical cancer disease in women previously exposed to HPV. A time relationship exists between the start of vaccination and the increase in the incidence of cervical cancer. The HPV vaccines were approved in 2006 and 2007, respectively and most young girls started to be vaccinated during 2012–2013. The Centre for Cervical Cancer Prevention (NKCx) in Sweden has noted in its annual report of 2017 (1), which includes data up to 2016, a substantial increase in the incidence of invasive cervical cancer, especially during the years 2014 and 2015. An English translation of the increase in the incidence of cervical cancer is given in Table 1 (1: p 45). The above information was gathered from the statistical database managed by the National Board of Health and Welfare in Sweden. The author of the report suggested that it is important to track the causes of the increase in the incidence of cervical cancer. However, no explanations were given for the increase in the incidence of cervical cancer by the NKCx in its 2017 annual report (1). For analysis, I have sub-grouped the data according to age, using the statistical database of the National Board of Health and Welfare (the same database used in reference ). In addition, the relevant literature was surveyed to put the current data in perspective. The increase in the incidence of cervical cancer was shown to be most prominent among women 20–49 years of age while no apparent increase was observed among women above 50 (Figure 1). The number of cases in the 20–49-year group increased from 202 cases in 2006 to 317 cases in 2015 (an increase of 50%). In 2015, there were 1.9 million women in Sweden between 20–49 years of age according to Statistics Sweden (2). The incidence of cervical cancer is therefore 0.17% for women in the 20–49-year group (317 cases per 1.9 million women). Figure 2 shows the relative change between 2006 and 2015 for each 10-year age group cohort, which illustrates the more pronounced increase in the incidence of cancer among the younger age groups. Fig. 1: Increase in incidence of cervical cancer among younger women (<50 years) as compared with women ≥50 years. The data shows the number of cases/100,000 women from 2006 to 2015. Fig. 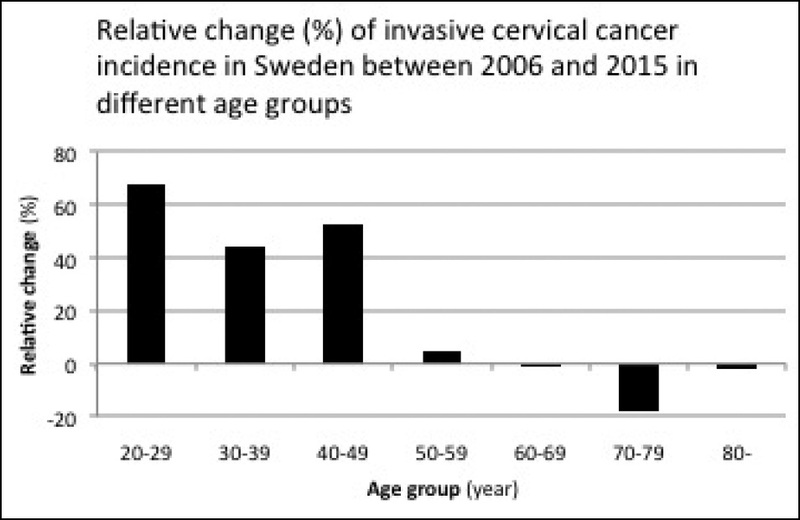 2: The relative change in percentage of invasive cervical cancer incidence in Sweden between 2006 and 2015 in different age groups. The figure is based on data from the statistical database of the National Board of Health and Welfare in Sweden. The incidence of cancer is age-adjusted according to the standard Swedish population in 2000. 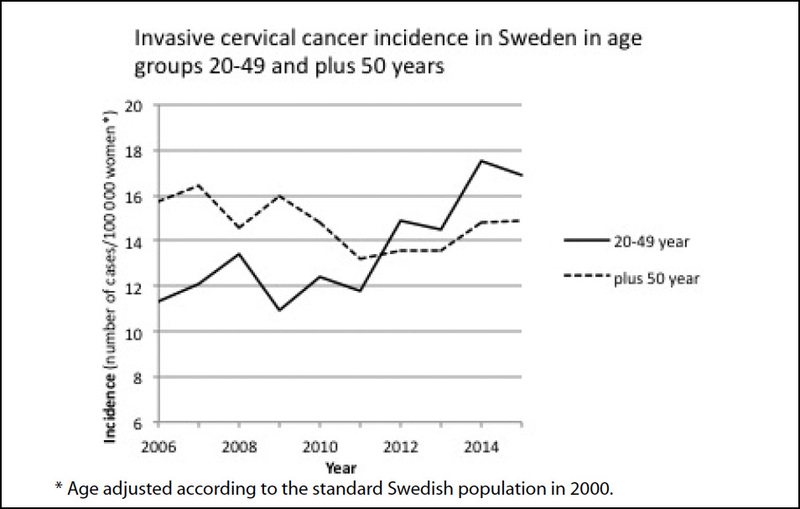 I discuss below some possible explanations for the increase in the incidence of cervical cancer among young women in Sweden. A change in the routine or other technical or methodological changes during the study period may affect the reported incidence of cervical cancer due to changes in the sensitivity of the diagnostic tools. The reported change in the incidence among younger women and the fact that the increase was noted in most counties in Sweden argue against this explanation. Neither was such an explanation given by the NKCx in its annual report of 2017, with data up to 2016 (1). Recently, when the Swedish media discussed the increase in the incidence of cervical cancer, the health authorities were unable to explain the increase. Another possibility is that HPV vaccination could play a role in the increase in the incidence of cervical cancer. About 25% of cervical cancers have a rapid onset of about 3 years including progression from normal cells to cancer (3, 4). Therefore, an increase may be seen within a short period of time. Gardasil was approved in Sweden in 2006. In 2010, the vaccination of a substantial number of girls started. In 2010, about 80% of the 12-year-old girls were vaccinated. Combined with 59% of the 13–18-year-old girls vaccinated through the catch-up programme in the same period, one can say that most girls were vaccinated. Thus, the oldest girls in the programme were 23 years old in 2015; and this is well within the younger age group shown in Fig. 1. For the older age group represented in Fig. 1, data on exposure to vaccinations is not available. In 2012–2013, most young girls were vaccinated. The vaccine does not need to initiate the cancer process. There is a possibility of the vaccine acting as a facilitator in an ongoing cancer process. I discuss below some possible mechanisms of how the vaccine might influence the incidence of cervical cancer. The efficacy of HPV-vaccines has been evaluated by studying premalignant cell changes in the cervix called CIN2/3 and cervical adenocarcinoma in situ or worse (5). The efficacy was calculated for individuals who have not been exposed to HPV 16 and 18. These individuals are called naïve. The vaccine is efficacious only in individuals not previously exposed to HPV 16 and 18 (naïve individuals). If an individual has already been exposed to HPV 16 and 18, no new antibodies are made. Therefore, the vaccine will not work for non-naïve individuals. HPV 16 and 18 are responsible for about 70% of all cervical cancers (5). It is therefore crucial to give the vaccine to naïve individuals. During their review of Gardasil by the FDA, the efficacy of the vaccine was also evaluated on individuals who were exposed to the oncogenic HPV strains before vaccination since individuals who are non-naïve will also receive the vaccination. A concern was raised for disease enhancement (increase in CIN 2/3, cervical adenocarcinoma in situ or worse) in this subgroup (5). In these individuals, the efficacy was -25.8% (95% CI: -76.4, 10.1%) (5). Thus, vaccination with Gardasil of non-naïve individuals who had HPV 16/18 oncogenes before vaccination showed a higher level of premalignant cell changes than did placebo. The FDA statisticians could not draw any firm conclusions. In their analysis, the FDA included only cases with HPV 16/18. If cases with oncogenes other than HPV 16/18 had been included in the analysis, the efficacy of data could have been even more unfavourable. The increase in premalignant cell changes in non-naïve individuals, as suggested by the FDA, is consistent with the knowledge that vaccination can cause reactivation of both target and non-target viruses (6, 7, 8, 9, 10, 11, 12). For Gardasil, the HPV types 16 and 18 are called target HPVs since the vaccine contains antigens for these two HPV types. Other HPV types for which the vaccine does not contain any antigens are called non-target HPVs. For individuals exposed to Gardasil, evidence of a selective and significant reactivation of the oncogenic non-target HPV types 52 and 56 was reported in the genital tract for all women (13). This article studied women 13–22 and 23–40 years of age from 2008 to 2013. The target HPVs 16 and 18 decreased only in the younger age group but oncogenic non-target HPVs increased in both the groups, 20%–40% and 8%–30%, respectively. The increase in the total burden of non-target oncogenic HPVs for vaccinated individuals may be consistent with the findings in the FDA report where the efficacy of the HPV vaccine was less favourable for non-naïve women compared with those on placebo. A possible mechanism to explain the increased incidence of cervical cancer may therefore be virus reactivation as described above. In the evaluation of Gardasil by the FDA, it was found that about 25% of all individuals were non-naïve in the pivotal trial (5). There are more than 200 types of HPVs, of which 12 are currently classified as high-risk cancer types (14). HPV may be found in non-sexually active girls (15). It may be transmitted through non-sexual means, either by way of mother to child, from contact with infected items, from self-inoculation or hospital-acquired infection (16), or via blood (17, 18). The virus can lie latent in any tissue and escape detection by standard techniques (19). It can also be redistributed systemically during the lytic cycle into previous virus-free tissues (auto-inoculation), for example infecting an earlier virus-free cervix. Recently, it was shown that previously HPV-positive women with normal cytology remained at increased risk of pre-neoplasia (CIN3) despite two follow-up HPV-negative tests (20). “Proving that HPV is absolutely gone is, of course, impossible,” state Brown and Weaver in an editorial in 2013 (21). Therefore, non-naïve-individuals can be seen among females at all ages. Sometimes these individuals have measurable HPV and sometimes not. When taking these results into account, the proportion of non-naïve individuals may be underestimated in the studies. Since the vaccine is recommended for up to 45 years in the European Economic Area, it is possible that the vaccination has facilitated the development of new or existing cervical cancer among women who were non-naïve at the time of vaccination. Vaccination against HPV has started in Sweden during the study period. Gardasil, the vaccine mostly used in Sweden, was approved in September 2006. There are no statistics for the overall use of Gardasil in Sweden. For young girls (12–13 years of age) there are special programmes for vaccination. About 75%–80% of all girls are vaccinated in this age group (22). For older girls there are catch-up programmes. For older girls/women who will be vaccinated on-demand, data on frequency of vaccination are missing. The increase in the incidence of cervical cancer between 2006 and 2015 was 50% (corresponding to 115 absolute cases). Therefore, the vaccination coverage of the Swedish population does not need to be very high to explain a role for the vaccine. The findings could be consistent with on-demand vaccination of women above 18. In Sweden there were 702,946 cervical cell screenings performed on women aged 23–60 years in 2016 (1). Could the HPV vaccination cause an increase in invasive cervical cancer instead of preventing it among already infected females and thereby explain the increase in the incidence of cancer reported by the NKCx in Sweden? The increased incidence among young females, the possibility of virus reactivation after vaccination, the increase in premalignant cell changes shown by the FDA for women who were already exposed to oncogenic HPV types and the time relationship between the start of vaccination and the increase in cervical cancer in Sweden could support this view. The answer to this question is vital for correctly estimating the benefit-risk of this vaccine. More studies focused on already HPV-infected individuals are needed to solve this question. Bain RW, Crocker DW. Rapid onset of cervical cancer in an upper socioeconomic group. Am J Obstet Gynecol. 1983;146(4):366-71. Hildesheim A, Hadjimichael O, Schwartz PE, Wheeler CM, Barnes W, Lowell DM, Willett J, Schiffman M. Risk factors for rapid-onset cervical cancer. Am J Obstet Gynecol. 1999;180(3 Pt 1):571-7. Walter R, Hartmann K, Fleisch F, Reinhart WH, Kuhn M. Reactivation of herpesvirus infections after vaccinations. Lancet. 1999;353(9155):810. Bayas JM, González-Álvarez R, Guinovart C. Herpes zoster after yellow fever vaccination. J Travel Med. 2007;14(1):65-6. Rothova A, de Groot JD, Mudrikova T. Reactivation of acute retinal necrosis after flu H1N1 vaccination. Br J Ophthalmol. 2011;95(2):291. doi: 10.1136/bjo.2010.185983. Epub 2010 Aug 23. Hwang CW Jr, Steigleman WA, Saucedo-Sanchez E, Tuli SS. Reactivation of herpes zoster keratitis in an adult after varicella zoster vaccination. Cornea. 2013 Apr;32(4):508-9. doi: 10.1097/ICO.0b013e318277acae. Hassman LM, DiLoreto Jr DA. Immunologic factors may play a role in herpes simplex virus 1 reactivation in the brain and retina after influenza vaccination. IDCases. 2016 Sep 22;6:47-51. eCollection 2016. Jastrzebski A, Brownstein S, Ziai S, Saleh S, Lam K, Jackson WB. Reactivation of herpes zoster keratitis with corneal perforation after zoster vaccination. Cornea. 2017 Jun;36(6):740-2. doi: 10.1097/ICO.0000000000001203. Lieberman A, Curtis L. HSV2 reactivation and myelitis following influenza vaccination. Hum Vaccin Immunother. 2017 Mar 4;13(3):572-3. doi: 10.1080/21645515.2016.1235105. Söderlund-Strand A, Uhnoo I, Dillner J. Change in population prevalences of human papillomavirus after initiation of vaccination: The high-throughput HPV monitoring study. Cancer Epidemiol Biomarkers Prev. 2014 Dec;23(12):2757-64. doi: 10.1158/1055-9965.EPI-14-0687. Epub 2014 Nov 7. Hamsikova E, Smahelova J, Ludvikova V, Salakova M, Rychla J, Skrenkova J, Rob L, Tachezy R. The prevalence of HPV infections in HPV-vaccinated women from the general population. APMIS. 2017 Jun;125(6):585-95. doi: 10.1111/apm.12677. Epub 2017 Mar 15. Ryndock EJ, Meyers C. A risk for non-sexual transmission of human papillomavirus? Expert Rev Anti Infect Ther. 2014 Oct;12(10):1165-70. doi: 10.1586/14787210.2014.959497. Bodaghi S, Wood LV, Roby G, Ryder C, Steinberg SM, Zheng ZM. Could human papillomaviruses be spread through blood? J Clin Microbiol. 2005;43(11):5428-34. Chen AC, Keleher A, Kedda MA, Spurdle AB, McMillan NA, Antonsson A. Human papillomavirus DNA detected in peripheral blood samples from healthy Australian male blood donors. J Med Virol. 2009 Oct;81(10):1792-6. doi: 10.1002/jmv.21592. Freitas AC, Mariz FC, Silva MA, Jesus AL. Human papillomavirus vertical transmission: review of current data. Clin Infect Dis. 2013 May;56(10):1451-6. doi: 10.1093/cid/cit066. Epub 2013 Feb 7. Polman NJ, Veldhuijzen NJ, Heideman DAM, Snijders PJF, Meijer CJLM, Berkhof J. HPV-positive women with normal cytology remain at increased risk of CIN3 after a negative repeat HPV test. Br J Cancer. 2017 Nov 7;117(10):1557-61. doi: 10.1038/bjc.2017.309. Epub 2017 Sep 7. Brown DR, Weaver B. Human papillomavirus in older women: new infection or reactivation? J Infect Dis. 2013 Jan 15;207(2):211-12. doi: 10.1093/infdis/jis662. Epub 2012 Dec 12. Under the current circumstances where publication of any information critical of vaccines can have serious personal repercussions, the author has chosen to publish under this pseudonym.